Hi, everyone. It's March, and this is the first time I've said anything here this year. Which is a good thing. I've been busy, certainly, running both my shops, Barkery and Biscuits, and Icing on the Cake. 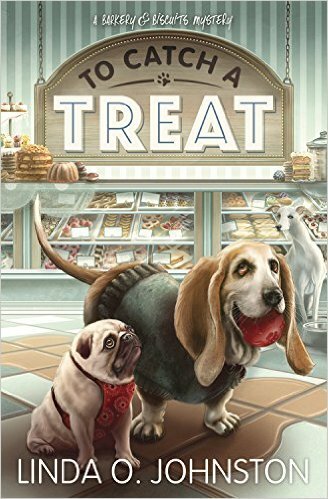 My assistants and I have, as always, done a lot of baking--all those fun, healthy dog treats for the Barkery, and the fun but not necessarily healthy people treats for Icing. Business has been good in both of them. Plus, my town of Knobcone Heights has been relatively quiet. At least there've been no more murders that I'm aware of. All seems well, including at my part-time job as a veterinary technician. Still... You may know that I've solved three murders lately. 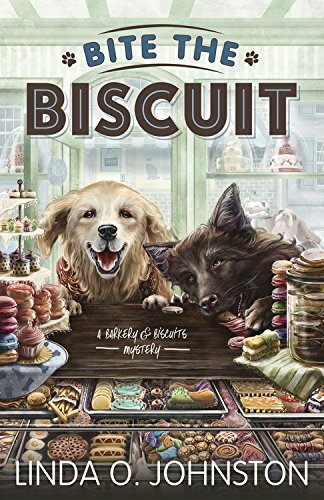 The most recent was described in a book called Bad to the Bone, and the others also were recounted in books: Bite the Biscuit and To Catch a Treat. But--well, I've been hearing things about some people about to visit Knobcone Heights who are mostly nice, yet something about the situation has been making me uneasy. Maybe that's because the person who's dared to write those books after I've solved the murders is hinting something else is about to occur. In fact, she tells me she has a title in mind for the book about the fourth murder I'll solve: Pick and Chews. Well, I hope she's wrong, of course. I really don't want any more murders in my wonderful adopted town. Although... well, if she's right, and someone I know and care about, as she's also hinting, is considered a suspect, I know I'll wind up getting involved. 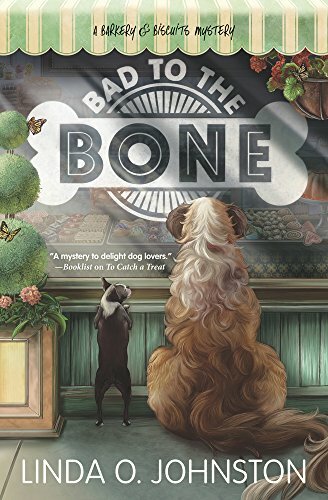 BAD TO THE BONE, the third Barkery & Biscuits Mystery by Linda O. Johnston, was a May 2017 release. 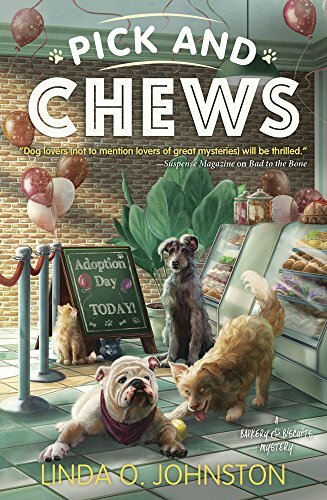 And yes, as Carrie's concerned about, there are more to come... including PICK AND CHEWS, which will be a May 2018 release. New series to me. I do like dogs on the page and in real life. Seems there are often more cats than dogs in the cozies. Dogs are just as cozy...right? Will be looking for these books. Good luck if a new case comes your way! I like cats, but I particularly love dogs, and that's why I've come up with special treats for them. And as for a new murder... well, we'll see.